I believe you guys have followed my articles on visiting famous RWB workshops from Thailand and Philippines and even watched some videos of the RWB built at other neighbouring countries which I shared from time to time. Isn't it time for our local Malaysia to have one RWB too? Guess what? At last, the RWB is here! Well, the word 'at last' doesn't really fit in here because, many might've already seen it a long time ago. Let's take a stroll back to the month of May when Nakai-san came all the way from Japan to Malaysia to build not one, but two RWBs! Join me and I'll bring you a little closer to the rough world of Nakai-san! I arrived at the place (a temple in Ulu Tiram) and the first thing I saw was her, the first RWB Malaysia - Yamato Nadeshiko, which was already completed and parked at the entrance welcoming everyone who visited the place. If you're building an RWB in Japan, you just need to pass your car to Nakai-san and after a few months, you can come and collect it without knowing what the colour and design will be. It's different for requests coming from outside of Japan. Like RWBs in Thailand, Indonesia and Philippines, the car and custom bodykits are prepared and painted in advance, before Nakai-san comes over to fit them nicely. #001 and #002 also went through the same process. Nakai-san came to Malaysia on May 26th and took just 3 days to complete Yamato Nadeshiko. Akira Nakai is the man who I've been wanting to meet. I've seen tons of his videos online and his work of making RWBs known to the world really amazed me. A little bit about Nakai-san. He has been building his trademark wide body on Porsches for more than 15 years and he has lost count of how many he has made for himself and his customers. Like in the videos, he has the cool and calm face, always looking focused in whatever he's doing. I was lucky to be able to see Mr Christian Coujin and his wife officiating the ceremony to mark the arrival of RWB to Malaysia. It was more like a ceremony giving life to the first RWB accompanied by the builder himself. RWB Malaysia was born in a temple! The RWB family. (From Left) Chinawat Kanitpong (Autohaus RWB Thailand), Christian's wife, Christian Coujin, Akira Nakai, Michael Lesmana & Yanto Widodo (Terror Garage Indonesia) and Jeab (RWB Thailand). Every time when a new RWB emerges, it's always somewhat different from the previous ones. Same goes for the RWB Malaysia #001. It's the first time we see this colour on an RWB and it's absolutely stunning. The dark metallic gray with slight green tint was specially picked by Michael Lesmana of RWB Indonesia. Christian dedicated this car to his mother and therefore, Nakai-san chose a very special name for Christian's RWB. 'Yamato Nadeshiko' or '大和撫子' is actually the name of a flower in Japanese, but it also signifies a pure, gentle and delicate lady. Sweet. 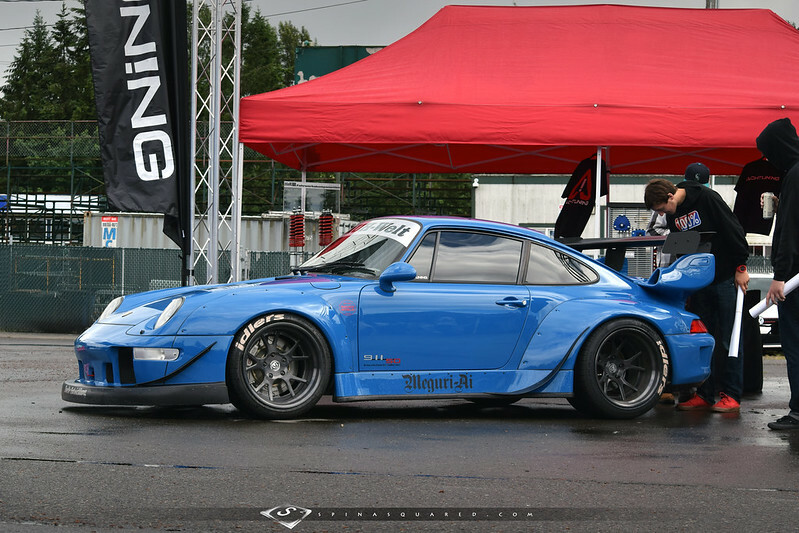 Apart from its unique name, it received Nakai-san's aggressive designed triple-tier wing or better known as Rotana wing (taken from his 993 Turbo) which helps in creating some downforce at the back of the car, but it is used mainly to portray the extreme look of RWB. The owner chose 10-spoke iForged Milano wheels over commonly used Work Meister S1 or Work Brombacher wheels, and they are wrapped in Pirelli P Zero Rosso performance tyres measuring 265/35R18 97Y in front and 335/30R18 at the back. Yamato Nadeshiko's wing is so high that it is even taller than the its 993 body. That is not the only crazy thing about the car. The original Porsche engine has been swapped with a 7.0L LS7 V8 engine from the Corvette, packing more than 600hp! And, it's running on airbags (AirREX suspension). I am sensing a bit of 'Victorianess' in this car. Notice the little love-shaped cutouts? Nakai-san's personal touch. However, it's still yet to be driven on the road and undergoing a thorough setup by experienced local tuners, as Christian intend to use it as a track machine. 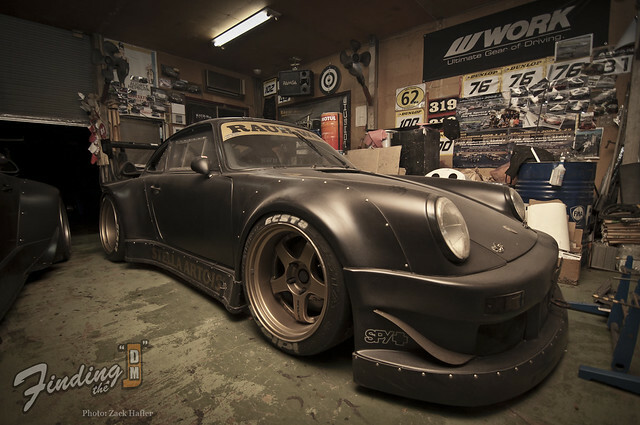 Soon, we'll be able to see this RWB tackling the corners at Sepang International Circuit. Can't wait. Back to the RWB Malaysia #002. In just 1.5 days, Nakai-san has completed the front bumper, the cutting of the original side fenders and fix up of the new and wide extended fender. Now, it's time for him to get the right fitment between the fender and the wheels. And yes, her name is Furinkazan (風林火山) which directly translates to Wind (Fu), Forest (Rin), Fire (Ka) and Mountain (Zan), taken from famous Sun Tzu's Art of War phrase - "as swift as wind, as silent as forest, as fierce as fire, as unshakeable as mountain." Even though this dark green 964 Carrera 2 won't be as extreme as the first one, it has a rare 3.8L engine from the Carrera RS variant! Wow! Seeing Nakai-san at work totally blown me away. Everyone doesn't simply call him the Japanese Porsche Master for no reason (in Japan, he's called 'Porsche Charisma Tuner' :D). He basically did everything by himself with his pair of magical hands and prefers the old school way of jacking up the car, grinding, cutting, bolting rather than using sophisticated machinery. RWBs are 100% hand built. If you stalked him long enough, you will have realised that he's a man of few words, and seems to be always looking at the car, thinking. Thinking whether each fitment in various areas are perfect or requires further adjustments. No doubt he's a perfectionist. He doesn't take 90% work as a complete work. Because to him, building RWBs is like creating a piece of art. It has to be done according to his way, his style. According to Michael, every Porsche prior to being "RWB-fied" has body structures in varying conditions that negatively affect performance. This is caused by different driving conditions and the environment those cars were driven in by their owners over the years. Nakai-san is a genius in solving problems like that and always have ways to overcome them. ... reinstalled them back, rocked the car to check for any inconsistent horizontal motion, and performed minor tweaks to reduce the tyre-fender gap to millimeters. Even though, he has this serious and cool face, he is actually a very humble guy. He appreciates people who like his RWBs, and never says no to anyone who approaches him for pictures/autographs. He is also not the type of person who will do it for money or for the fame. I admired his character and personality, and his genuine passion for Porsches in his own style. Now, I know a little better of Nakai-san. One thing that I find unique in Rauh-Welt brand is the close group of friends that Nakai-san created which is known as the 'RWB family'. It started from customers who love owning and driving these cars, and to close friends who support Nakai-san at every eventful occasion. They are passionate for cars and cool guys as well. ... continued the next day working at other incomplete parts on the Furinkazan - side skirt, rear bumper, rear GT wing, decal application, and etc. He targeted to complete RWB Malaysia #002 by Sunday and catch the plane flight on Monday back to Japan. And, the finished product looked like this. Building an RWB is not simply putting the kits together. You'll feel it's not true when you watch him work. For Nakai-san, it is his commitment to the things he loves most and the aim for perfection, creating one special RWB at a time. Not only it has to look awesome, it has to be an enjoyable piece of machine for owners to have absolute fun in it. It was an unforgettable experience meeting the RWB master and (partially) seeing how RWB is brought to life. For that, I'd like to thank Mr Christian Coujin, Miss Kit, Mr Kong and Nakai-san for having me here at this important event for Malaysia. Proudly we can say, the RWBs are here! FD Malaysia 2013 Video by YAER Prods.